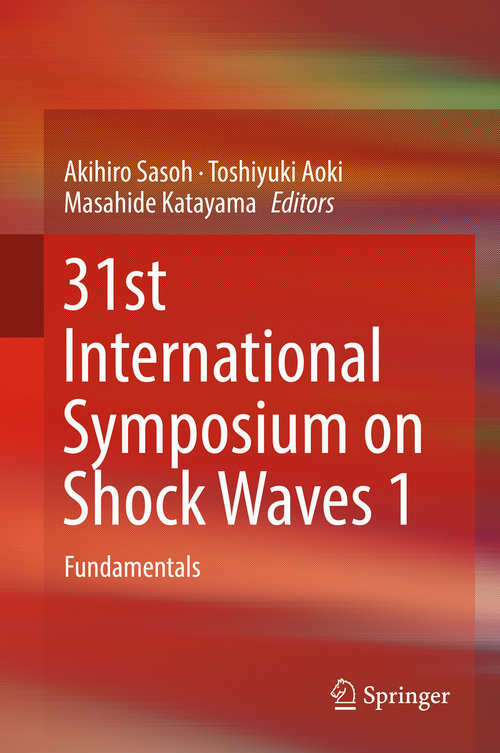 This is the first volume of a two volume set which presents the results of the 31st International Symposium on Shock Waves (ISSW31), held in Nagoya, Japan in 2017. It was organized with support from the International Shock Wave Institute (ISWI), Shock Wave Research Society of Japan, School of Engineering of Nagoya University, and other societies, organizations, governments and industry. The ISSW31 focused on the following areas: Blast waves, chemical reacting flows, chemical kinetics, detonation and combustion, ignition, facilities, diagnostics, flow visualization, spectroscopy, numerical methods, shock waves in rarefied flows, shock waves in dense gases, shock waves in liquids, shock waves in solids, impact and compaction, supersonic jet, multiphase flow, plasmas, magnetohyrdrodynamics, propulsion, shock waves in internal flows, pseudo-shock wave and shock train, nozzle flow, re-entry gasdynamics, shock waves in space, Richtmyer-Meshkov instability, shock/boundary layer interaction, shock/vortex interaction, shock wave reflection/interaction, shock wave interaction with dusty media, shock wave interaction with granular media, shock wave interaction with porous media, shock wave interaction with obstacles, supersonic and hypersonic flows, sonic boom, shock wave focusing, safety against shock loading, shock waves for material processing, shock-like phenomena, and shock wave education. These proceedings contain the papers presented at the symposium and serve as a reference for the participants of the ISSW 31 and individuals interested in these fields.